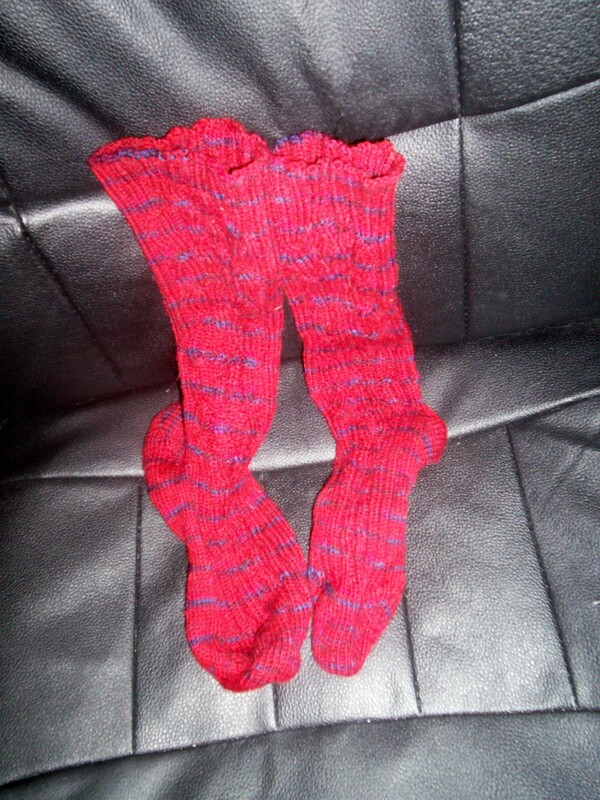 I finished the school insomnia’s aka the playoff socks just in time for the Canucks to bottom out and be eliminated from playoff standings. You can’t really see all the cableing work, and yes that is my fault and the fault of my camera…. but a new one is on the wishlist and maybe someday I’ll actually get it. For now it’s more of a “if I need it” kind of budget…. The handspun delight shawlette was compleated and blocked, you may notice I flubbed the point (how I may never know) but I am content, as similar to me it’s just a little off. It also shows off the transitions perfectly, this was the first time I tried to spin a semi-graduated color shift, and i think all the work really paid off. It will come in handy on chilly nights. Never to be one left without a sock on the needles this lovely fellow is the cherry swirl from handmaiden/fleeceartist. In Nyomi (i think) Black, brown, and electric green? HELL YES!. It’s martian tastic. No spinnig yet, I really need to get some serious carding done, and I will. It’s at times like these I wish I had a drum carder. As I don’t I shall continue with my hand carding rolags. 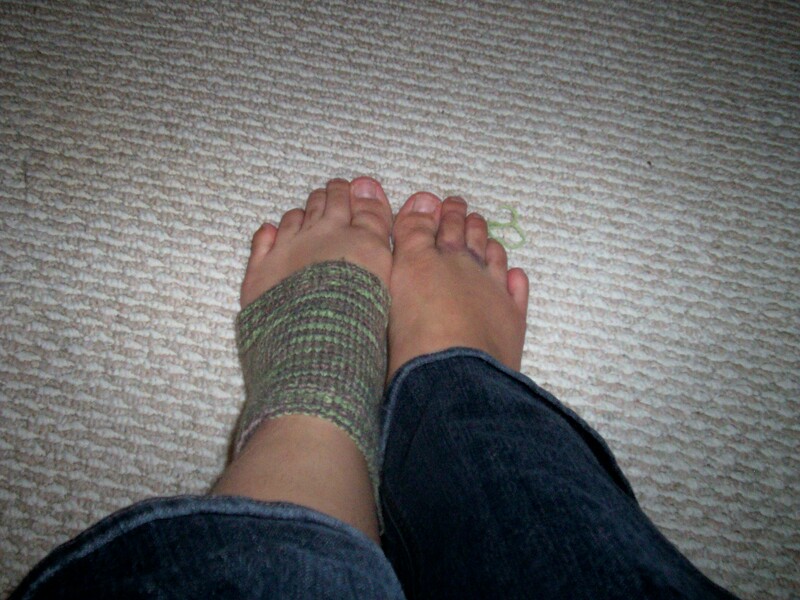 I finished the first of the yoga socks for stacy, and as you may notice I busted up my right foot something fierce. A little advice, if the cat wants food at 2 in the morning, feed the cat, don’t think you’ll make it back to your bed safely, she will attempt to kill you. It’s actually looking a little better the one toe is now returning to a color that is not purple black, and the other one seems to be fine dispite the large purple bruise across the base. 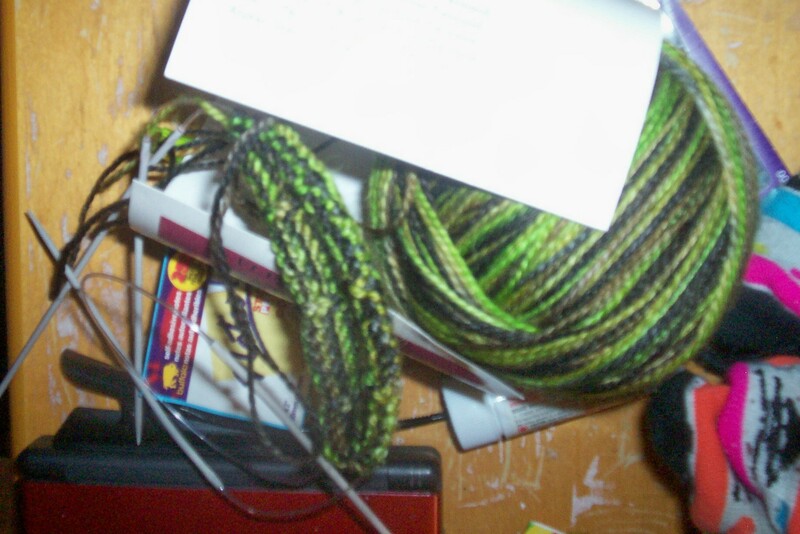 I have however been knitting sporadically, mostly because the end of the semester left me marking papers and attempting to write (and re-write) my own. 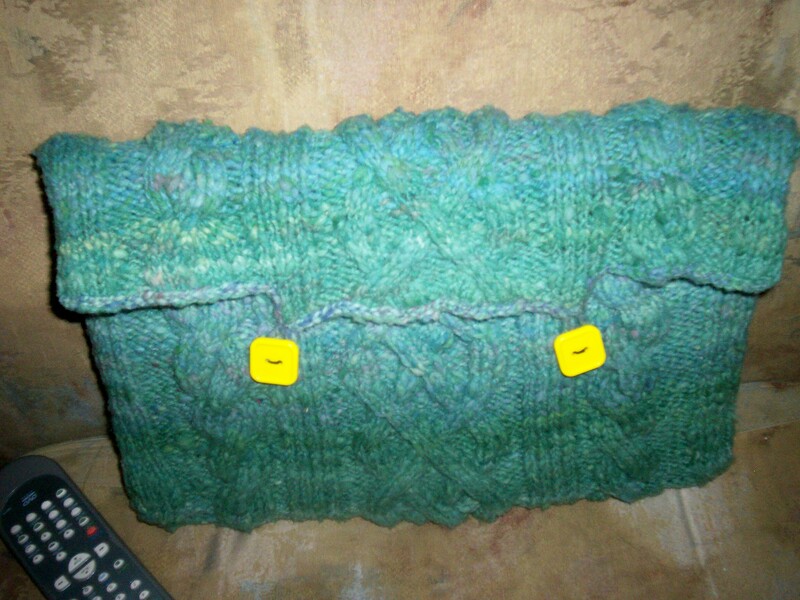 I’m not sure if ya’ll have seen the finished laptop cosy, but here it is in all it’s buttony glory. I dislike sewing on buttons and crocheted edging for the most part (fiddly picky work kind of drives me insane), but it finally got done, and now ten speed can rest safely in her home. 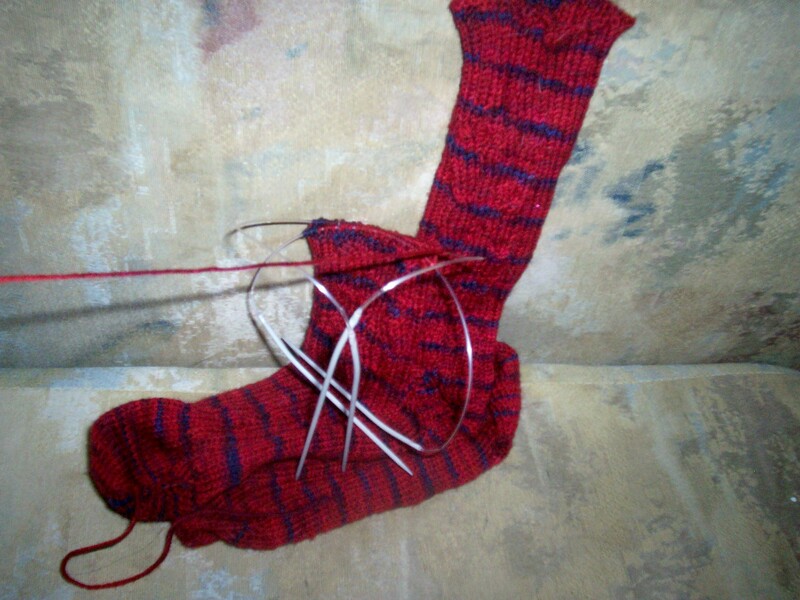 The school insomnia socks are coming along, and are quickly being changed into the “playoffs insomnia socks” as I’ve knit more on them watching the Nucks than I have at school lately. 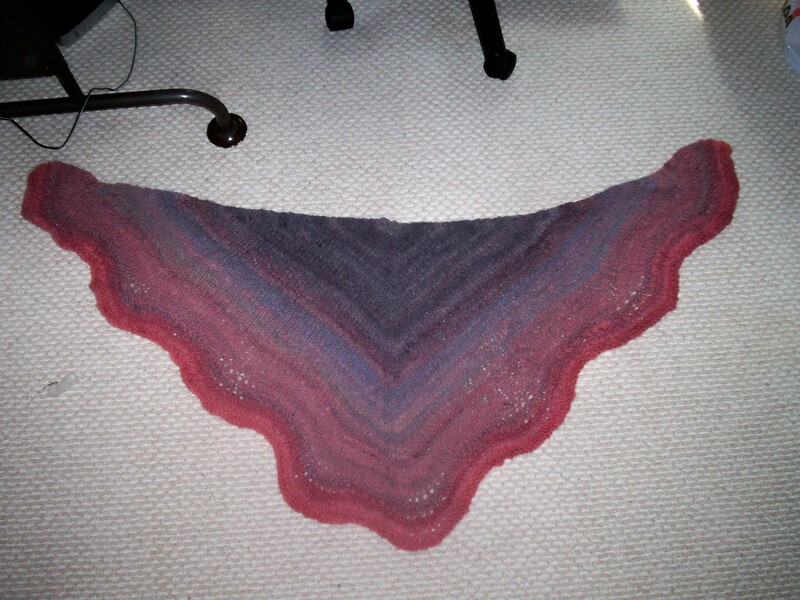 The handspun shawlette is still in the works. 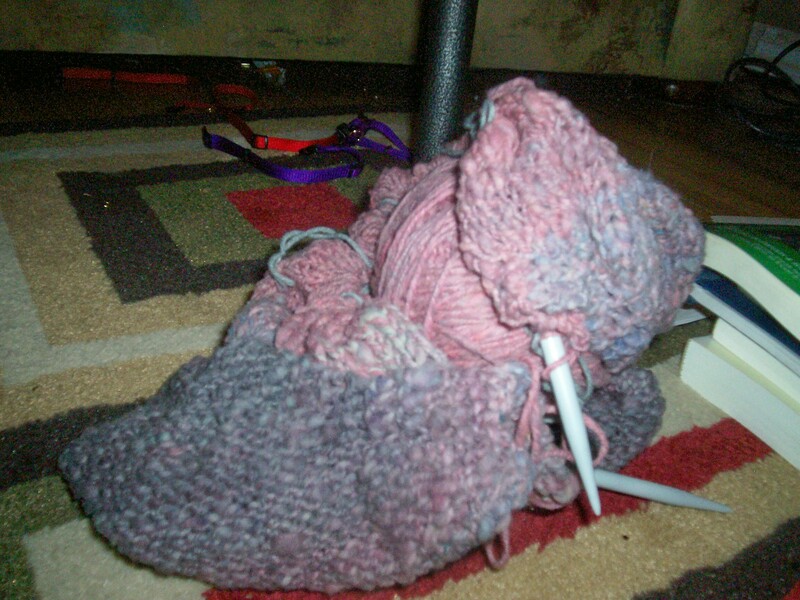 I messed up somewhere and have to recount stuff (I know way to go sadie you managed to mess up stockinette), but I shall deal with it sooner rather than later. So you see I am alive, I’m just broken (the whole broken toe, bruised face, messed up shoulder has taken me out a bit). Although with spring trying to spring (aside from the snow the last two days) I’m more inclined to want to spin or card….